Can you never find what you need in your bag or purse? Then you’ll need the Kangaroo Keeper! It helps you organize and easily find what you need and fits into your purse. You can easily take it out and swap out bags and purses without having to fumble around to move everything. * Perfect Purse Hook – FREE! 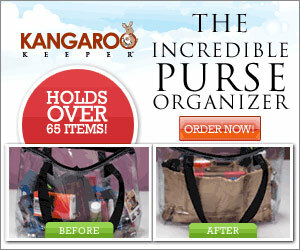 Also, if you purchase the Kangaroo Keeper today, you’ll also receive an extra set for free! Buy 1 Get 1 Free!